This Magazine → What’s the true cost of clean drinking water for Canada’s First Nations? 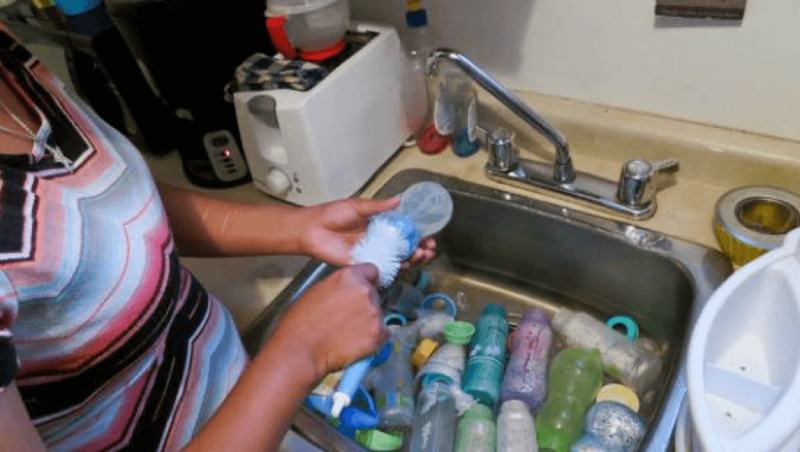 A mother of an infant with a chronic illness demonstrates one of the steps she takes to ensure her baby is not exposed to contaminants in the water. She lives in Neskantaga First Nation in Ontario, and says that it takes her an hour each time to properly wash and rinse his bottles. Photo by Samer Muscati/Human Rights Watch. Every day a member of the Kinonjeoshtegon First Nation drives 70 kilometres from Lake Winnipeg’s western shore to a store in Dallas/Red Rose, Man. to buy 40 20-litre jugs of drinking water. That water is intended for elders and single mothers on the Jackhead Reserve, as Kinonjeoshtegon is also known, who don’t have access to a vehicle to get it themselves. Many homes in the 350-person community have private wells, but they produce hard water that’s not desirable to drink. Indigenous and Northern Affairs Canada (INAC) gave the community a $170,000 cheque to upgrade a 1970s-era pumphouse in January, but it’s not clear whether that will eliminate the problem. To that end, the current Liberal government has pledged to eliminate drinking water advisories in First Nations communities by 2021. But according to some estimates, their proposed funding is barely half of what’s needed. Here’s a look at the numbers. The Liberals’ five-year budget for the cause, starting in 2016. That’s an average of $360 million each year. INAC’s commitment over the seven years leading up to 2016. This is slightly less than the Liberals’ budget. The necessary capital investment the government actually needs to make to accomplish its goal, according to the Parliamentary Budget Office. The PBO reports that nearly 40 percent of 807 drinking water systems in 560 First Nation communities are “high risk,” affecting a quarter of all reserve dwellers. The problem is especially acute in Ontario and British Columbia, where nearly half of drinking water systems are considered high risk. $1.2 BILLION to ensure water systems meet safety codes. $2 BILLION for future maintenance. An Indigenous-owned private sector firm pegs the figure even higher, at $4.7 billion, based on higher population growth assumptions. How does the Jackhead Reserve fare? The amount INAC gives Jackhead each year for “water systems,” which the reserve uses to purchase the bottled water. What the government has promised for a new water treatment facility. Construction is set to begin this spring. If you enjoyed this article, please consider supporting This and help us continue producing our award-winning journalism. Subscribe to the magazine or donate today!